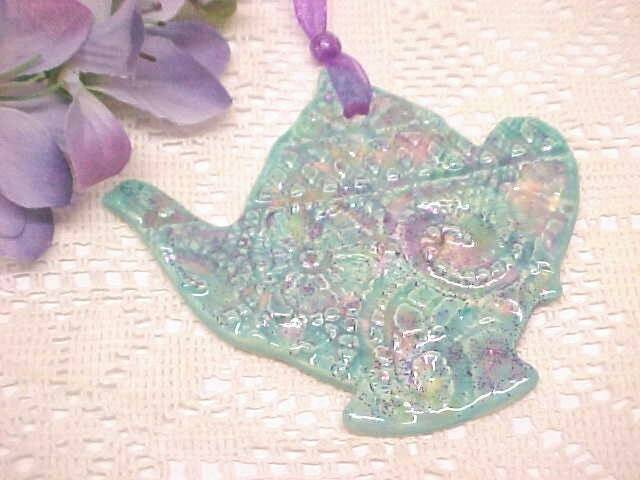 I hand crafted this lovely ornament from porcelain, impressed a gorgeous piece of lace while damp & glazed in many glaze colors before firing, including Turquoise, Pink, Emerald Green & Purple. 🎀 MEASURES about 3 1/4 inches wide tip to handle, about 3 inches top to bottom. With Purple organza ribbon, hangs about 5 inches long. Back is unglazed & has my stamp. Nicely thin, not heavy. Ready to Mail when purchased. I make all my own pottery & fire in my kiln!